St Cuthbert’s Church in Carlisle has had a chequered history. These days its easy to miss tucked away as it is down a side lane between the House of Fraser and the Crown and Mitre. St Cuthbert preached in Carlisle but it didn’t stop the Vikings destroying the church that stood on the spot. It was William Rufus who ordered that the church should be rebuilt and it escaped the worst of the great fire of 1292 as well as the attentions of assorted besieging Scots. In 1644 when the Parliamentarians closed the cathedral and the parish church of St Mary’s which lays inside the cathedral the mayor made St Cuthbert’s the city’s Civic Church. It remains so to this day. 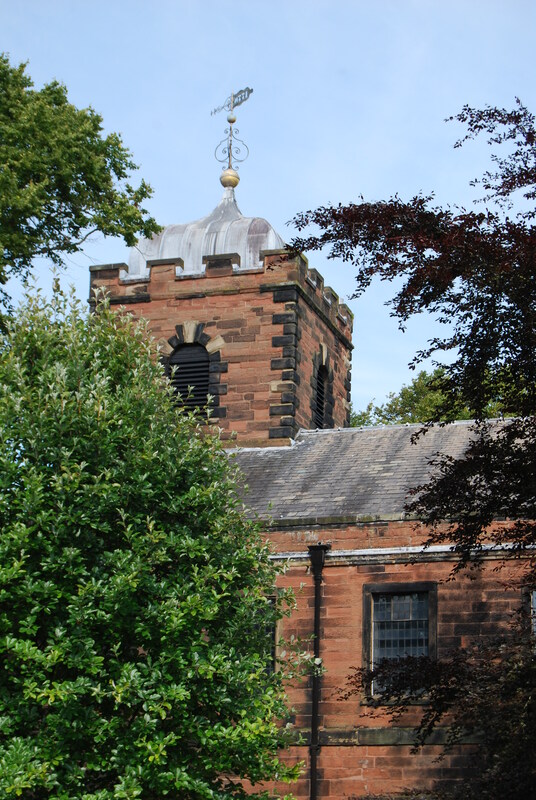 However, in 1777 it was decided that the church should be rebuilt, though the opening of the new church was delayed by a particularly bad storm in 1778 it took only two years to raise the money for the building and fitting out of the new church. Nothing remains of the medieval church apart from some fragments of glass. The churchyard is an oasis of green in a city environment. Headstones have been placed against the churchyard walls so there is no indication of the spot where executed felons and Jacobites were laid to rest. There’s a further link to Carlisle’s troubled past as the last town besieged in England inside the church in the form of the royal coat of arms which were placed there in the aftermath of 1745 to remind the citizens of Carlisle where their loyalty lay. Back outside, the graveyard is the final resting place for members of the Royalist garrison who died during the siege of 1644. The guide-book also makes reference to a highwayman and if that weren’t lively enough in December 1823 the body snatchers came calling in Carlisle. Graves were tampered with, two bodies went missing and one was discovered parcelled up ready for transportation. Who would have thought there was so much history lurking in such a peaceful spot? This entry was posted in Carlisle, Eighteenth Century, Nineteenth Century and tagged body snatchers, Edward Bruce. Siege of Carlisle, Jacobites, St Cuthbert's Church, William Rufus by JuliaH. Bookmark the permalink.